Sorry, but we are not taking online bookings after 2nd November 2019. Please try again or contact us on 01729 823496 if you wish to discuss your break. Are you looking to book more than one room? 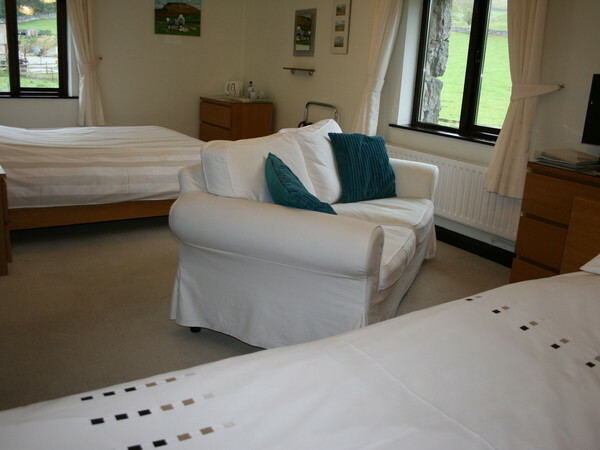 If so, to see the availability of our double and twin rooms, please try again, booking one room at a time. Alternatively, please call us on 01729 823496 to book. Our rooms can be booked, one at a time, easily online. Simply select your preferred arrival date, the number of nights you plan on staying and the number of guests. When you click on the 'Check availability' button you will be shown the rooms and their availability status. Selecting three or four guests will restrict the view to our family room. If the room is free for your chosen time, you will see the price for your planned stay and given the option to book. Should you decide to book, just click on the 'Book' button and complete your contact details on the following page. We ask that you check our terms and conditions before booking. Once the booking has been completed, we will get back to you by email to confirm all the details. 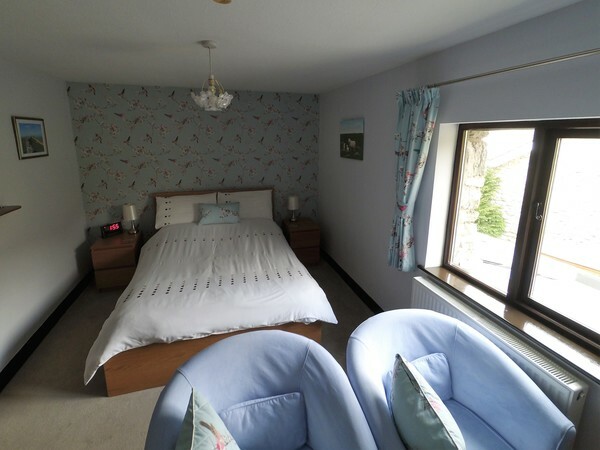 Our superior room - Three Peaks is a very large (20 sq metres) and spacious double room fitted with a king size bed and separate seating area with sofa and armchair where you can relax at the end of a busy day in front of a flat screen TV. In addition, it has an en-suite with large shower cubicle. There are superb open views across the sheep meadows to Pot Scar. 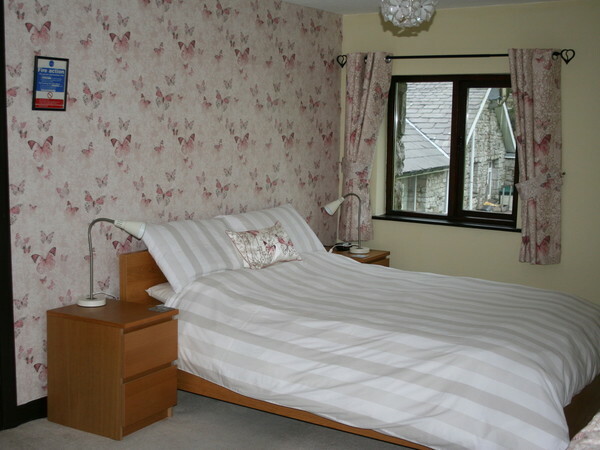 Our front facing, first floor double room - Pen y Ghent is a spacious (17 sq metres) room which has breathtaking views to the west. The room includes two easy chairs from which you can enjoy the views or relax in front of the flat screen TV. The room also features a large ensuite (6 sq metres) including bath and shower. 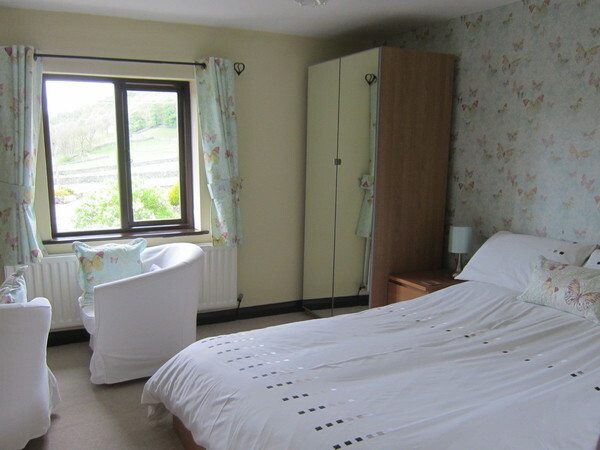 Our second double room - Whernside is a good size (14 sq metres) room which also has an en-suite with bath and shower. It includes two easy chairs from which you can enjoy the views or relax in front of the flat screen TV. This room looks over the lambing nursery enclosure. Our conveniently situated ground floor twin room - Ingleborough is a large (17 sq metres) room which has breathtaking views to the west. The room includes two easy chairs from which you can enjoy the views or relax in front of the flat screen TV. The room also features a large ensuite (6 sq metres) including bath and shower. 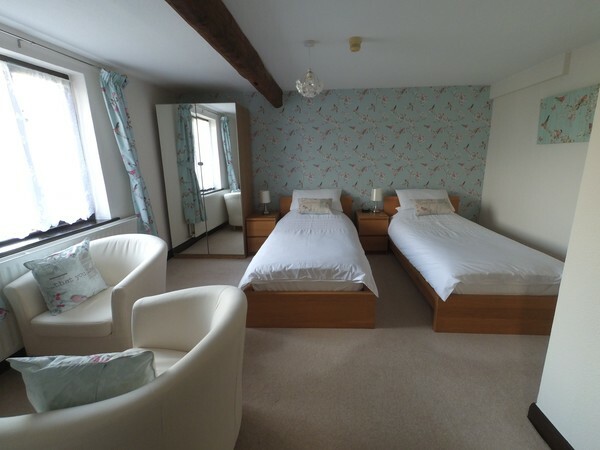 Our family room - Three peaks is a large (20 sq metres) room fitted with a king size bed and one or two single beds depending on your needs. It also has a flat screen TV. In addition, it has an en-suite with large shower cubicle. There are superb open views across the sheep meadows to Pot Scar. We ask for your contact details to allow us to contact you in advance of and during your stay with us and then retain the data for our own marketing purposes and so that we can contact you in future. We will never provide your data to any third party. Please untick this box if you do not want us to retain your personal data beyond the length of your stay. Click 'Book' to reserve the room, which we will hold for 5 days pending receipt of your deposit of 20 pounds per room per night. Deposit payment details will be provided within our booking confirmation email.